Looking at the premise of Jawbone you’d be forgiven for sighing and thinking not another boxing film. In the last couple of years alone Bleed for This, Southpaw, Creed, Grudge Match, and Hands of Stone have all been released, with mixed success. Cinema’s love of the sport is evident but means that each subsequent release finds it more difficult be original. It can be hard to know what can be added to the genre when classic films like Raging Bull have already been made. Jawbone follows Jimmy McCabe, a former youth boxing champion whose life has fallen apart in a milieu of alcohol and self-destruction. After being evicted from the council house that he grew up in, Jimmy returns to his old gym to train for a final fight and get a much needed pay check. It is in the ring that the film really shines. The fights feel both tense and fierce, and had me jumping around in my seat. Former boxing champion Barry McGuigan was consulted for the film and his expertise was clearly utilised, as each punch feels real and each bruise earnt. 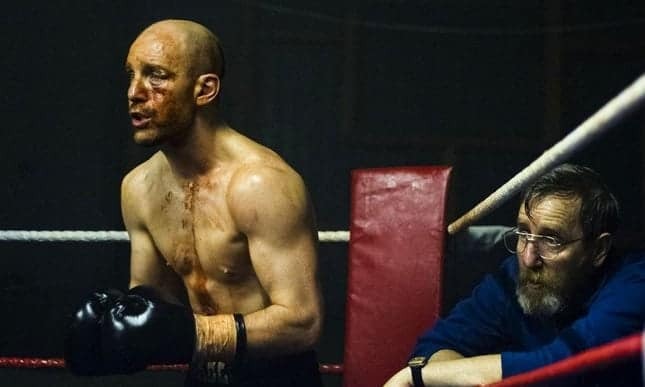 Johnny Harris is convincing as the desperate and downbeat alcoholic boxer. He obviously has a feel for the source material, and is also the screenwriter, and his performance is the emotive heart of the film. Ray Winstone and Michael Smiley, playing the gym owner and trainer, meanwhile stray into cliché and play roles very similar to those seen in countless boxing films before. It is the script that really lets Jawbone down. The plot developments and character arches are inconsistent and left me feeling cheated. Ray Winstone’s illness is particularly miscalculated and leaves a void at the central of proceedings. It is perplexing how he can go from being an active boxing coach to terminally ill and dead in a mere two weeks. When motives and actions are based on something so unconvincing it makes the entire film feel hollow. Each time the story began to convince me of the world that it depicts it inserted a strange or misplaced plot point that made me sceptical of that I was watching again. The soundtrack from Paul Weller is well put together and has a cohesion that the rest of the film lacks. It subtlety changes to complement the events and emotions on screen, and is particularly effective during the fight sequences where it helps build tension and a sense of the brutality of the ring. It is an impressive first soundtrack from Weller and it would be good to see him do more work for film in the future. Jawbone attempts to be a realistic look at the self-destruction of a former boxing prospect, but some dazzling fight scenes and touching moments are ultimately undermined by lazy plot turns and character developments. What could have been an interesting social drama or uplifting redemptive tale is instead just another boxing film that struggles to separate itself from the better and more iconic releases that have come before it. Jawbone is on general release from Friday 12th May. It is clear from this review by Wyndham Hacket Pain that he/she was looking for a certain type of film from the get-go. It seems all too easy to get lost in preconceived ideas and lose the sense of open-mindedness when spending a career as a film critic if you were to judge it based on this review. Shame.